To learn how to use Entrez search engine to retrieve nucleotide/protein sequence data. Entrez is an integrated search engine which allows users to search and retrieve different data from the National Center for Biotechnology Information (NCBI). 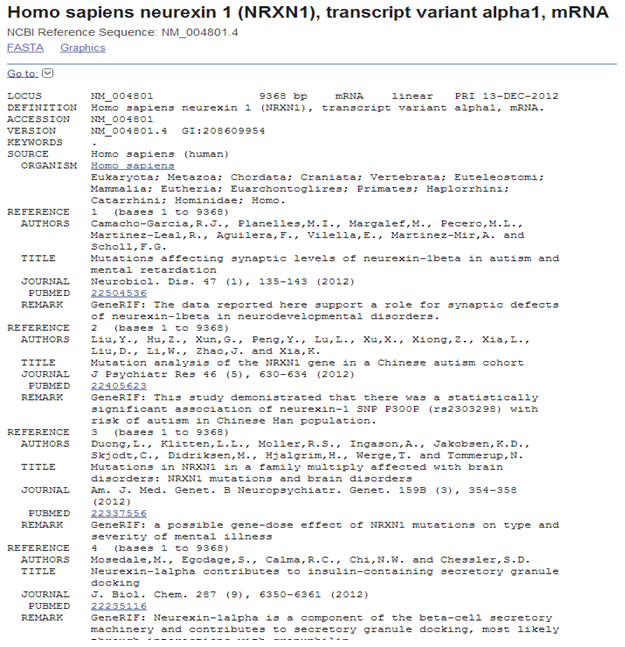 It can be accessed from the site www.ncbi.nlm.nih.gov/Entrez/. Entrez is NCBI’s major text search and retrieval system which integrates PubMed database and 39 other scientific literatures, nucleotide and protein databases, protein domain data, population study datasets, expression data, pathways and systems of interacting molecules, complete genome details and taxonomic information into a tightly inter linked system. These component databases can be accessed using one single query. Create public databases for storing, retrieving, and analyzing knowledge about molecular biology, biochemistry, and genetics. Conduct research in computational biology, for analyzing the structure and function of biological molecules. Develop software tools for analyzing genomic data. Entrez thereby act as the search engine for NCBI databases.Searching can be made more precisely by using Boolean operators like AND, OR or NOT with the search statement. Limits allow user to filter his search according to their choice. An Advanced Search interface allows performing more detailed queries. The different queries can be searched on the following basis. The syntax for searching queries as shown below. Search term [tag] Boolean operators [AND, OR, NOT] Search term [tag]. User can perform Global search by selecting the default option “All Databases “, which displays result from the different databases and their number of records available for each database will also be showed. The databases are arranged in three main sections, of which the top section contains information about literature databases, the middle section includes molecular databases and the bottom section includes accessory literature database journals, NLM Catalog and MeSH. The associated databases included in the Entrez are as follows. The results of the query search are represented in different data formats like GenBank, FASTA. GenBank : GenBank is a collection of annotated DNA sequences, which is the NIH genetic sequence database. The different parameter components included are explained below. Locus name helps in group entries with similar sequences. The first 3 characters denotes the organism, the fourth and fifth characters gives other group designations, such as gene product and the last character is a series of sequential integers. Sequence Length contains number of nucleotide base pairs (or amino acid residues) in the sequence record. Molecule Type shows the type of sequenced molecule . Genbank Division shows the GenBank division to which a record belongs and is indicated by a three letter abbreviation. Modification Date shows the last date of modification. Definition is a brief description of sequence that includes information such as source organism, gene name/protein name, or some description of the sequence's function. Accession number indicates the unique identifier for a sequence record. Version shows a nucleotide sequence identification number that represents a single, specific sequence in the GenBank database. GI "GenInfo Identifier" is a sequence identification number for the nucleotide sequence. Keywords describes word or phrase of the sequence. Source indicates free-format information including an abbreviated form of the organism name, sometimes followed by a molecule type. Organism describes the formal scientific name for the source organism and its lineage. Reference includes publications by the authors of the sequence that discuss the data reported in the record. Authors contains List of authors in the order in which they appear in the cited article. Title represents the title of the published work or tentative title of an unpublished word. Journal: MEDLINE abbreviation of the journal name. Features shows information about genes and gene products, as well as regions of biological significance reported in the sequence. Source is a mandatory feature in each record that summarizes the length of the sequence, scientific name of the source organism, and Taxon ID number. Can also include other information such as map location, strain, clone, tissue type, etc., if provided by submitter. Taxon is a stable unique identification number for the taxon of the source organism. CDS (Coding sequence) represents region of nucleotides that corresponds with the sequence of amino acids in a protein. FASTA: It is a file format used for representing nucleotide or protein sequences as a string with some basic tag or identifier in which nucleotides or amino acids are represented as single letter codes. A FASTA sequence starts with a (>) greater than symbol which implies the beginning of a new sequence records called as definition line (“def line”). An accession number or version number is followed by description of that entry. DNA sequence in either uppercase or lower case letters starts from the next line. The sequences contain 60 characters per line. These sequences which are stored in the database were obtained from different experimental methods. Most commonly used methods for DNA sequencing are Sanger Method and Maxam-Gilbert Method. Similarly Edman Degradation method and Mass Spectrometry technique are used for protein sequencing.